Most high end outdoor BBQ grills use propane gas, natural gas, charcoal or a combination of these heat sources, but the electric grills in that category are becoming more popular. Nowadays many people are most of the time not allowed to grill in apartments or condo’s with charcoal or propane gas. Reason many people look for any higher end grill is that they are willing to pay a little more for a lot more quality. In many cases it is well known that you get what you pay for and a barbecue grill is no exception to that rule. It is not always easy to recognize, for example, the best high end gas grill brands. We did many grill reviews to help you find the best grill for your purpose. There are many expensive grill brands that make great grills but it takes a lot of time to compare all the features of them. We will write high end grill reviews of many expensive grill brands we think are worth the money you spend on them. From portable to built in and from charcoal to electric. Just to mention a few of the top brands that will be reviewed by there most popular models. You can have a look a the Napoleon Grill reviews here. For the Weber lovers we started to review their high end grills. In our Weber grill reviews we will have a good look at many models. The first one is the Weber Q3200 review here. Click on the link to see what we found out about this Weber 2 burner propane and natural gas grill. When we did our outdoor electric BBQ grill reviews we found one high end BBQ we really liked. 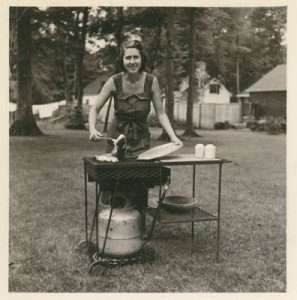 The Kenyon electric grill is one of the last one made in America by a family owned business from Connecticut. The quality is well known and these grill will last for many years. Available in 120 and 240 Volt and in a portable and built in version for your outdoor kitchen. You can read the whole Kenyon electric grill reviews here. What a lot of these Kenyon grills have is the option to make them a perfect fit for your outdoor kitchen, Boating or RV’ing. Built in or separate it is all possible for this what I personally would like to call one of the top end grills. We found this high end designer grill and had a good look at it. A top design does not always mean a great grill. You can find our full Fuego grill review by clicking on this link. We will also advice on accessories and of course high quality grill covers to protect your grill from the elements. Char Broil is a well known brand and I consider after doing all the char broil grill reviews and especially the infrared features this grill that they have some high quality grills. If you look at the reviews we did on the gas grills in the higher priced segment there are few things that justifies the higher prices. The quality of the used materials are of a better rate. Metal gauges are higher. This means thicker steel and most of the time stainless steel. The gas burners of cheaper models do not last to long on average. I have bought cheap portable gas grills in the past and the burner most of the time lasted one or two seasons at the most. My recent small gas grill that I reviewed is my Char-Broil grill2go x200 (click on the link to read the review) is of a lot better quality and the burner is still in perfect condition and even the push button ignition worked right away after not having used it for almost 3 months. The cheaper grills that you can buy for around $50 will most of the time have no spare parts that you can purchase. Even the lower priced models of the top brands do not have that option in many cases. The grills with the higher price label have the advantage that spare parts are most of the time widely available. This can make that your grill can be maintained for a few dollar and last a lot longer. These kind of high end grill or better quality grills most of the time will have a better and more even temperature over the grill surface. This is like we mentioned a result of all the higher quality components like burners, heat reflectors, grill grate and a lot more. The used materials in the better quality grills, including the regulator will result in wider temperature range and a better way of keeping the temperature on the right setting. If you read reviews of the lower end gas grills than this one of the complaints you hear the most. Like we wrote before the high end smokers and in particular the pellet smokers have a better steel gauge and the welds and seams are better and more air tight. Our favorite pellet smokers are the Rec Tec grill and you can read our Rec Tec pellet grill review here. The second one is the Traeger pellet grill and with the new digital controller they are even better now. You can read the Traeger pellet grill review here and form your own opinion. Like I mentioned there are quit a few benefits of spending more on a BBQ. But you always have to asses if it is worth the extra money you spend on it. If you are an occasional BBQ’er I would personally not spend a lot of money on a grill. However if you grill or smoke meat and other food like vegetables more than ones in a while it is worth considering the extra cost. The price related to durability and the fact that most of the time the spare parts are available means that your grill will last a lot longer. For grills for in the RV or on the Boat it is almost a must to have one of the better grills like the Kenyon Frontier or the electric version. They get moved more and probably have to withstand the weather more in the way they are getting used. It is hard to give an exact recommendation when to think about spending more, but after doing so many BBQ reviews but here is what I think. In case of one of the high end BBQ grills that are also called built in BBQ grill reviews we did, I guess those are meant to be used a little longer and investing more is probably worth it.